Did you know the entire pea plant is edible and delicious? Peas are one of the earliest vegetables you can sow in the garden. If you don't have the patience to wait until they fill out to start eating them, you can enjoy a harvest of pea tendrils and tender pea shoots long before your actual peas mature. All parts of the pea plant are edible. As the pea leaves and stems mature, they tend to get tough and stringy, but when they are young, the pea shoots are not just tender, they're also crisp and tasty. They have a pea-like flavor, but even fresher. The same goes for those curling, clinging tendrils the pea plants use to hold on to supports. You’ve probably seen them on plates in Asian restaurants and trendy eating establishments. Since pea plants fade in warm weather, timing is an issue in getting a good crop of peas. Harvesting and eating some of the young pea shoots and tendrils is a great way to extend your pea growing season. Pea shoots and tendrils may look exotic or sophisticated, but even gardeners who can’t grow peas to maturity can grow pea shoots and tendrils. There’s no trick to growing these shoots and tendrils. Just seed a few additional pea plants, to have some to harvest early. It's best to seed some peas specifically for harvesting shoots and tendrils. You can snip a few here and there from the pea plants you are growing for the peas themselves, but that will prolong the wait for pea pods and diminish the size of the harvest. It is easier to simply sow a few extra plants. Plant the seeds for your shoots and tendril harvest at the same time you would normally plant peas in your area, as soon as the ground is workable and has had a chance to dry out a bit after winter. Since the plants you sow for shoots and tendrils won't need to mature and set pea pods, they won’t need as long a growing period. That means you can reseed another crop up to about 1 month before the warm weather sets in. You can even grow pea shoots indoors, in the winter. Once your pea plants are about 6 to 8 inches tall, you can snip off the top growth including one set of leaves. This will be your first, small harvest. Cutting off the growing tip will encourage the plants to branch out and continue growing, making more shoots and tendrils. After that, you can continue harvesting the top 2 to 6 inches of the pea plants every 3 to 4 weeks. You can harvest shoots, leaves, and tendrils, as well as any flowers or buds that may have formed. Eventually, you’ll notice the shoots aren’t as tender as they were earlier in the season and the flavor will start to turn bitter. Stop harvesting at that point. If the weather stays cool, you may get pea pods forming on these plants. However, chances are good the pea season will be over before that happens. Some gardeners contend that leaving the plants to grow and trimming them back to about 4 inches in late July will result in a new harvest of pea shoots and tendrils in the fall, but you can't rely on that happening. It is more likely that the plants will succumb to the dry heat or insects before then. If you want a fall harvest, you will need to reseed at the end of the summer and hope for a long, cool fall. Any type of pea will suffice, but sugar pod peas are the easiest types to grow for shoots and tendrils since they tend to shoot up faster and stay light and crisp. "Oregon Sugar Pod" seed is readily available and great for shoots and tendrils. Pea shoots and tendrils are tender enough to serve with minimal or even no cooking. They are often tossed into salads, sandwiches, or on top of soups. You can always add a few curls as an edible garnish to any dish. 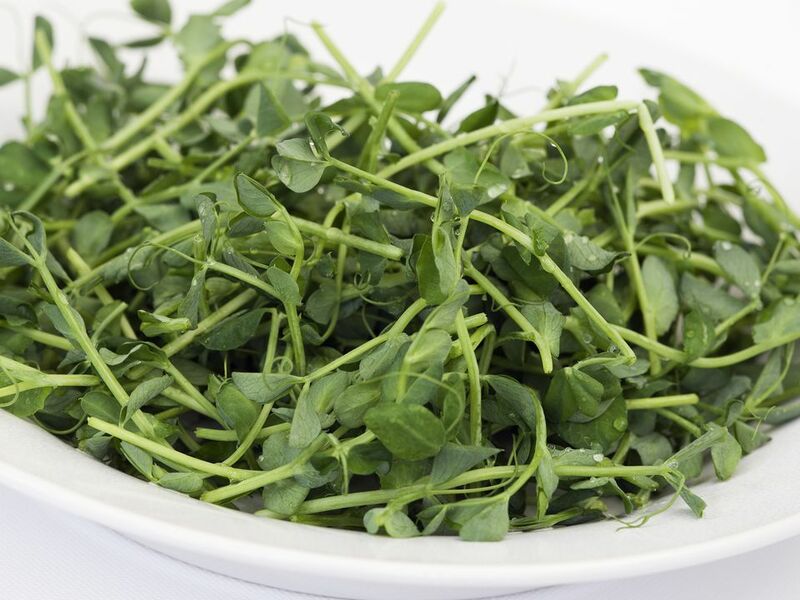 Pea shoots and tendrils are also a tangy addition to stir-fried dishes or simply steamed or sautéed with your favorite seasonings as a side dish.